ART GLASS TEARDROP by Accent Plus home decor, jewelry, decor, decorations, electronics, fountains, floor mats, art glass, vases, garden essentials, fireplace screens. Inspired by the Sommerso glass artisans of Italy, an artful teardrop shimmers in jewel tones of sapphire, peridot and amber. 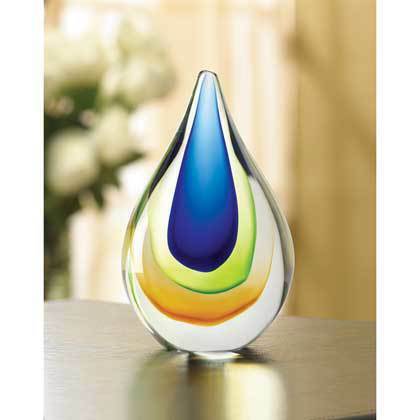 A splendid sun-catcher when placed on a sill, or a tasteful paperweight when displayed atop a desk. Sure to delight any art-glass aficionado!Material(s): GLASS. Weight 2.5 pounds. Dimensions 4" x 2" x 6.5".